The ninth edition is now available! From now on you can read the November edition online, download the PDF or get it in real life at the medical faculty building (in the bookshelf near the stairs at the entrance or at the study square). 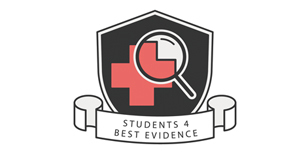 In this edition you can find our new rubric: the zebras of medicine. The zebra that will be discussed in this edition is “the genital arousal syndrome”. 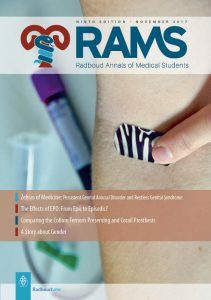 Read about this and more diverse articles, for instance about the effects of EPO or about transgenderism in the ninth edition of RAMS! Do you encounter a zebra you would like to write or know more about? Please let us know at submit.rams@ru.nl. Liesbeth Klein, Goran Puretic MD, Mazziar Mohaddes PhD, Prof. Johan Kärrholm PhD. Jontie Honey, Astrid Witters, Eline Misane MD, Jort van Rij. Vera M. Kho, Wendy Schreurs. Vera M. Kho, Janneke Elzinga.